The Egyptian capital of Cairo, the largest city on the African continent and in the Islamic world, long known as the "Gateway to the East" and a mediator between Christianity and Islam The area is known to the Egyptians as Masr al-Qadima and stretches down to the sub-area often called Coptic Cairo. Again, appropriate dress covering the body including shoulders and legs is required for entering both Coptic and Islamic monuments. Old Cairo is so named because it is the oldest part of Cairo, and in fact, predates what is now Cairo. Some Egyptologists believe that there was a settlement here as far back as the 6th century BC. Later, the Romans built a fortress here which we call Babylon. Some of these Roman walls still exist. Later, it became a Christian stronghold, with as many as 20 churches built within an area of one square mile. There are only five remaining, but these are certainly a must see when visiting Cairo, along with the earliest Mosque ever built in Egypt. In addition, after the fall of Jerusalem in about 70 AD, the area also saw an influx of that religion into the area, where the oldest synagogue is also located. Most of Pharaonic Egypt is a relic of one of the World’s first and grandest religions, including the great Pyramids outside Cairo. Yet if the modern world can be said to have four major religions consisting of Christianity, Hinduism, Islam and Judaism, then three of those are represented by some of their most ancient relics in this section of Old Cairo. Just southwest of Coptic Museum is the Hanging Church built into the walls of the Water Gate of the Roman fortress. It is possibly the oldest Christian church in Egypt. This entrance leads into the Monastery and Church of St. George . This is not an old church, dating only from 1909, but there has been a church in Coptic Cairo dedicated to the Martyr since the 10th century. Turn left outside the door to St. George and the path leads to the Church of St. Sergius (Abu Serga), which legend has it is built atop one of the sites where the Holy Family rested on their flight from Herod. Continuing on this path brings one first to the Ben Ezra Synagogue , which is Egypt's oldest and dates to the 9th Century. Past that is St. Barbara , named for the young girl who was martyred for trying to convert her father to Christianity. There is also a gate that leads to the Greek Orthodox cemetery, which surrounds the complex to the east. Mosque of Amr Ibn al-As Though little remains of the original structure, this Mosque is the oldest in Egypt, its ancestor having been built in 642 AD. 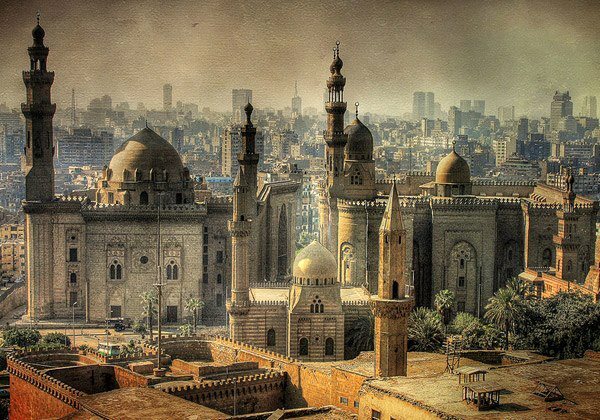 Old Cairo visit would give you a different insight of Cairo and Egypt. It is the home to Islamic and Coptic heritage that tell the story of Egyptians life during the Coptic and Islamic periods. Mosques, churches and synagogues are the common sightseeing in the area offering a unique religious community that you would not probably witness in else where along with the traditional Arab Souq of Khan El Khalili you would get most of Egypt historic and cultural picture completed. Wekalet El Ghouri offers a tannoura dance show, Al Moez street is a nice walking tour at night, Al Fishawy cafe would also give you an opportunity to get mixed with locals and experience a close insight f how tolerant they are and foreigners welcoming. Old Cairo is the visit that would change the way you knew Egypt in history books or TV shows, it is a full of life moving portrait of Egypt day life with tolerant past, Old Cairo is the visit of Egypt that you should not Miss ! Planning a Trip to Egypt Pyramids?. Book Budget 3 Day Egypt Pyramid Tour Packages. Cairo Pyramid Tour in Egypt With Group to Giza Necropolis, Saqqara and Old Cairo Egypt Tour package. Explore the Top Historic Attractions in Cairo in This Cheap Cairo Group Tour.